Nominal heating capacity 168 ÷ 359 kW. 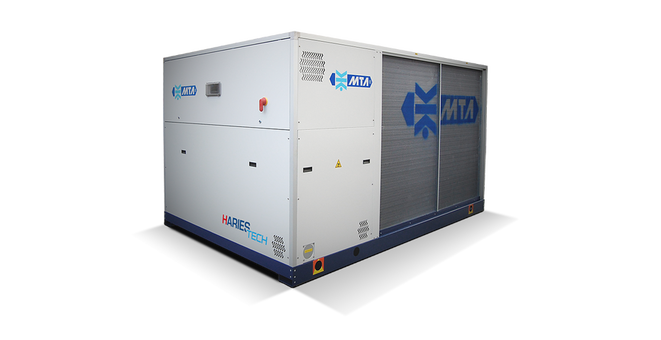 The reversible heat pumps of the HARIES TECH series, with environmentally friendly R410A refrigerant, represent the best solution for centralised hydronic air conditioning for medium areas (such as hospitals, offices, shopping centres, etc.) and offer energy savings in all operating conditions. The technical solutions adopted contribute practically to the reduction of operating costs of the system and to protection of the environment. These include: scroll compressors offering high seasonal energy efficiency, high efficiency plate heat exchangers, for operation in more favourable energy efficiency conditions; refrigeration circuits with separate aeraulic sections to progressively stop fans according to the instant thermal load; partial heat recovery for sustainable use of electricity. The advanced defrosting logics ensure maximum environmental comfort and a high economy of service compared to traditional systems. The wide range of accessories and versions offers solutions to the most varied of installation requirements and at the same time facilitating installation, start-up and management of the system. Integrated hydraulic group composed of either: single or double circulation pump with mid and high available head pressure, storage tank, expansion vessel, automatic load kit, automatic vent valve and drainage tap.